The Choose Tool Folder command in the Custom Tools menu allows you to choose a location in which to store documents containing custom tools that you use frequently. The tools contained in these documents appear automatically in the Custom Tools menu when you start Sketchpad, so they are always available. When you choose this command, a dialog box appears. Choose a folder from the dialog box, or create a new folder. You can give the folder any name you like. If the Create Example Tools document in chosen Tool Folder box is checked, Sketchpad will copy into the folder a Sketchpad document called Example Tools.gsp. This document contains a number of tools that show the variety and usefulness of custom tools. 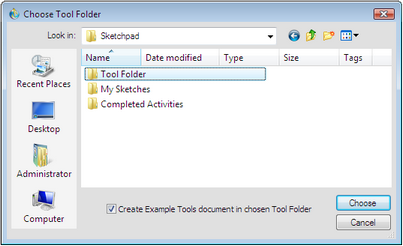 Once you've chosen a Tool Folder, use it to save your own Sketchpad documents containing tools. Every tool in this folder will be available whenever you start Sketchpad, without any need to open the documents containing the tools. On Windows you can also use a command-line flag to set a specific tool folder that takes precedence over the chosen Tool Folder. If you want to choose a different Tool Folder, there's no need to forget the current one first; just use the Choose Tool Folder command to identify a different folder. 2.Choose File | Save As. 3.Use the Save As dialog box to navigate to your chosen Tool Folder. 4.Save the document in your Tool Folder. Alternatively, you can drag Sketchpad documents into this folder from other locations on your computer to make their tools available the next time you start Sketchpad.